Just Policy Blog: Celebrating putting one more person in prison? 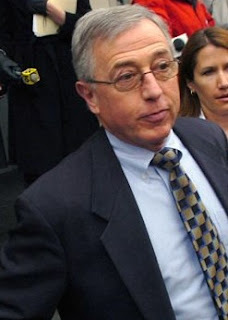 Recent news of former Luzerne County, Pennsylvania juvenile court judge Mark Ciavarella’s conviction and 28 year prison sentence hit the wires this week, to much acclaim. His conviction acknowledges his horrendous actions in taking bribes for sending youth to private prisons, in effect ruining these kids’ lives. Ciavarella needs to be held accountable for his actions. But what worries me about the ensuing celebration over his long prison sentence, is that we are jumping on the same hype that we frequently try and fight. How often have we fought against long prison sentences for kids when the media and community cry for more punishment? How often do we talk about wasteful incarceration and the negative effects on families and the people who are incarcerated? And yet, this is thrown out the window this week as we celebrate the extensive prison sentence of a person who was convicted of a nonviolent offense? Now, I know what you’re saying. He’s a bad man, he hurt a lot of people with his actions and caused some irreparable damage. And he did. Kids lives are forever changed and families continue to struggle with his actions. But is prison really the answer? Does sending this judge to prison for what might be the rest of his life improve a child’s life? Does it put families back together? Does it improve public safety? When I think about sentencing policies, I want to ask myself these questions—does this improve public safety? Is it fair? Do the monetary and social benefits outweigh the costs? If you can answer yes to all of these questions, incarceration may be the answer. But I can’t do that in this situation. At $23,000 a year, I cannot justify locking up this man for 28 years at the cost of $644,000. What else could we be doing with this money that would better benefit these children? And since this particular person, as far as I know, has never committed a violent offense, sending him to prison probably isn’t improving public safety. So let’s talk about fairness. All 4,000 of these kids’ cases were dismissed and their records expunged. While you cannot “expunge” the experiences that these children had while incarcerated, maybe there is more that can be done to try to reverse some of the damage and make things right. The restorative justice movement is based on the idea that wrongdoing is not only a violation of the law, but also of relationships between two people. This judge was punished for breaking the law, he was not punished because of the negative impact he had on those children. Through restorative justice, “offenders” can make amends for their actions and “victims” can choose to forgive. Perhaps a better way to hold these judges accountable is to have them make amends to those children and their families and to the entire community. As advocates for criminal and juvenile justice reform, we know that “an eye for an eye” is not effective policy, and initial impulses to punish in the way we are used to seeing punishment in this country is against everything that we fight for on a daily basis. We are all angry at what these judges did to the kids in Luzerne County, but rather than celebrate yet another person going to prison—a person whose family will suffer in his absence, much like the families of the victims have while they were incarcerated—why not look at what we can do to make this right for the victims, those 4,000 kids whose lives were forever changed. What do they need to heal from this experience? And what can we as a justice community do to make sure that this never happens again? Nastassia Walsh is JPI's Research Manager. Perhaps it would help if you would define "restorative justice". Negative actions require negative consequences; otherwise there is no disincentive to commit crime. In this case, what punishment would be appropriate for the criminal rather than incarceration? Force him to pay fines to all those he affected until he has nothing left? Do we need to give judges more latitude to create more appropriate punishments for criminals? How do we monitor that? Incarceration is not right for every situation, but what's the alternative? Thank you for your comment, Pete. I think Kay Pranis, a leader in the restorative justice field, said it well: “As a society, we have been thinking that the only choice we have in responding to crime is to get meaner and meaner until we frighten people into behaving as we wish. But that is not the only choice we have for managing behavior, and fear is not the most powerful motivator.” Rather than what is becoming the norm in punishment—incarceration—we should be looking for ways to hold people accountable, while also making sure that the victims feel that justice is served. Incarceration is not the only way, nor arguably the best way, to do this. Instead, restorative justice seeks to connect victims and the people who committed the offense to make amends, in whichever way is necessary. Sometimes restorative justice involves conversations or mediations. Sometimes it involves programs such as “impact of crime” classes that show a person the impact that their crime has on people. These types of programs can not only help the current victims, but also help ensure that this person will not offend in the future. Turning this offense into something positive, where the judges can give something back to the children they harmed, and the communities they impacted, could have a longer lasting effect than a 28 year prison sentence.